Worcester, Mass. – While cars powered by hydrogen fuel cells offer clear advantages over the electric vehicles that are growing in popularity (including their longer range, their lower overall environmental impact, and the fact that they can be refueled in minutes, versus hours of charging time), they have yet to take off with consumers. One reason is the high cost and complexity of producing, distributing, and storing the pure hydrogen needed to power them, which has hindered the roll-out of hydrogen refueling stations. Engineers have long recognized the power — and limitless availability — of hydrogen, the most abundant element in the universe. Hydrogen occurs naturally in the environment, but it is almost always chemically bound to other elements–to oxygen in water (H2O), for example, or to carbon in methane (CH4). To obtain pure hydrogen, it must be separated from one of these molecules. Virtually all of the hydrogen produced in the United States is obtained from hydrocarbon fuels, primarily natural gas, through steam reforming, a multi-step process in which the hydrocarbons react with high-temperature steam in the presence of a catalyst to produce carbon monoxide, carbon dioxide, and molecular hydrogen (H2). A host of metals and alloys are liquid at the standard operating temperatures found in steam reforming systems (around 500 degrees C), and most of these are far less expensive than palladium. In addition, a membrane made with a film of liquid metal should not be prone to the defects and cracks that can render a palladium membrane unusable. The WPI study, published in the Journal of the American Institute of Chemical Engineers, is the first to demonstrate that in addition to these advantages, liquid-metal membranes also appear to be significantly more effective than palladium at separating pure hydrogen from other gases, suggesting that they may provide a practical and effective solution to the challenge of supplying affordable hydrogen for fuel-cell vehicles. "The recent shift to electric cars is irreversible," said Datta. The next step after electric vehicles, he and others believe, is hydrogen-fuel vehicles — if the hydrogen supply puzzle is solved. Like battery-powered electric cars, fuel-cell vehicles have electric motors. The motors are powered by electricity generated inside the fuel cell when hydrogen and oxygen combine in the presence of a catalyst (the only "waste" product is water). While they can pull oxygen from the air, the cars must carry a supply of pure hydrogen. Many researchers have focused on bringing the cost of that hydrogen down by making better and thinner palladium membranes. Some of the most advanced membranes were produced by retired WPI chemical engineering professor Yi Hua "Ed" Ma, who, with considerable funding from industry and the U.S. Department of Energy, pioneered a process for binding palladium to a porous steel tube, resulting in palladium layers as thin as 5 to 10 microns. Making the palladium layer thin increases the membrane's flux, or the rate at which pure hydrogen moves through it. "But if a membrane is too thin," Datta said, "it becomes fragile or it develops defects. And the membranes need to be defect-free. If they develop even a hairline crack or a micropore, you have to start over." 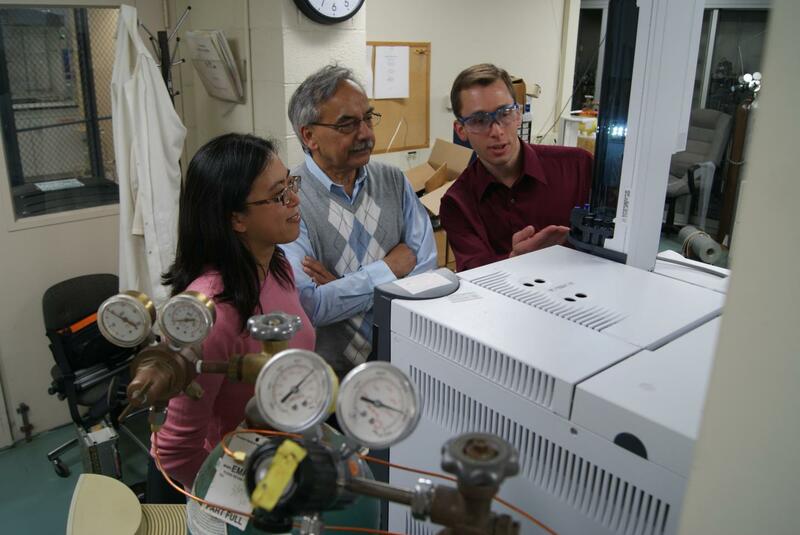 Six years ago, Datta and his students began to wonder whether liquid metals might overcome some of palladium's limitations — particularly its cost and fragility–while also, potentially, offering superior hydrogen solubility and permeance. "Besides chemical affinity, permeance depends on how open a metallic crystal structure is," he said. "Liquid metals have more space between atoms than solid metals, so their solubility and diffusability should be higher." After a literature review revealed no previous research on this topic, Datta successfully applied for a $1 million award from the U.S. Department of Energy to study the feasibility of using liquid metals for hydrogen separation. he and his team, graduate students Pei-Shan Yen and Nicholas Deveau (Yen earned her PhD in 2016; Deveau received his in May), decided to begin their exploration with gallium, a nontoxic metal that is liquid at room temperature. They conducted fundamental work that revealed that gallium was an excellent candidate, as it demonstrated significantly higher hydrogen permeance than palladium at elevated temperatures. In fact, laboratory studies and theoretical modeling conducted by the team showed that a number of metals that are liquid at higher temperatures may have better hydrogen permeance than palladium. While liquid gallium showed great promise as a material for hydrogen separation, creating a functioning membrane with the metal proved challenging, Datta said. "It turns out that liquid metals are very reactive," he said. "You cannot place gallium on a porous metal support, as Professor Ma did with palladium, since at higher temperatures it quickly forms intermetallic compounds that kill the permeability." The team discovered that the metal will also react with a number of ceramic materials commonly used as supports in palladium membranes. Through modelling and experimentation, they compiled a list of materials, including carbon-based materials like graphite and silicon carbide, that do not chemically react with liquid gallium but that are also wettable by the liquid metal, meaning that the metal will spread out to form a thin film on the support material. Aware that the surface tension of liquid metals was likely to change in response to variations in temperature and the composition of the gases they were exposed to, potentially producing leaks, they decided to insert the metal between two layers of support material to create a sandwiched liquid-metal membrane or SLiMM. A membrane consisting of a thin (two-tenths of a millimeter) layer of liquid gallium between a layer of silicon carbide and a layer of graphite, was constructed in the lab and tested for stability and hydrogen permeance. The membrane was exposed to a hydrogen atmosphere for two weeks at temperatures ranging from 480 to 550 degrees C. The results showed that the liquid gallium film was up to 35 times more permeable to hydrogen than a comparable layer of palladium and that diffusion of hydrogen through the sandwiched membrane was considerably higher than for a typical palladium membrane. The test also showed that the membranes were selective, allowing just hydrogen to pass through. "These tests confirmed our hypotheses that liquid metals may be suitable candidate for hydrogen separation membranes," Datta said, "suggesting that these materials could be the long-sought substitute for palladium. There are a host of questions that still need to be answered, including whether the small membranes we constructed in the laboratory can be scaled up and whether the membranes will be resistant to substances present in reformed gases (including carbon monoxide and sulfur) that are known to poison palladium membranes. "But by demonstrating the feasibility of sandwiched liquid-metal membranes, we have opened the door to a highly promising new area of hydrogen energy research," Datta added, "for there are many other metals and alloys, beyond gallium, that are liquid at 500 degrees C. It is a vast open field, in terms of what materials you might use. Also, it poses a host of interesting scientific questions."